Are Google and Apple fleecing customers with tablet storage? I was shopping for a micro SD card the other day and found at Popular Bookstore, Kota Kinabalu that a 32GB (Class 10) card is selling for RM99 (less than £19). Read on to find out why you should be feeling like you're being hard done by, when choosing a tablet with storage size of between 16GB and 32GB or higher. Gadget makers including Apple and Google have been accused of ripping off customers with overpriced tablet storage upgrades. Choosing between tablet models typically means deciding whether you want mobile data or not, and how much internal storage you want. However, Which? reports that consumers are getting a rough deal when it comes to paying more for higher storage capacities. For example, the entry-level iPad Air costs £399 for 16GB (RM1,599 in Malaysia) and you'll have to pay an extra £80 to double this to 32GB. The 32GB iPad Air with WiFi is selling at RM1,929 in Malaysia. There's no memory card slot for adding more, like many other tablets, so picking the right one is important. Which? 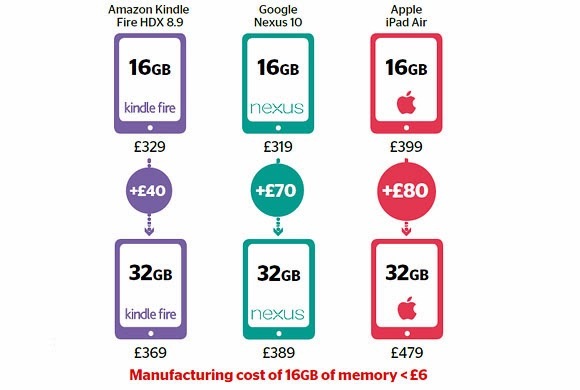 claims that the memory upgrade only costs Apple £6 making the upgrade a mark-up of 1,267 percent. Ben Miles from PC maker Chillblast. Google and Amazon charge £70 and £40 for the same upgrade for their Nexus 10 and Kindle Fire HDX 8.9 respectively. The mark-ups aren't as bad when compared to Apple but still represent a big jump compared to the market price for memory. "With tablets in demand this Christmas, buyers will be shocked to discover what a raw deal they're getting on built-in memory. If you want the best value storage, then buy a tablet with a SD or microSD slot and add a memory card for a fraction of the cost." - Richard Headland, editor at Which? The other issue with storage is the fact that users don't get the advertised amount. This blew up significantly with the Samsung Galaxy S4 which touted 16GB of storage but less than half was available to the user due to the space taken up by the operating system and pre-loaded apps and software features. TheGreenMechanics: I feel like I am being hard done by! Really. a smart way to to overcharge.